Queen Ka' Ahumanu Highway Expansion (HI) | WEST Consultants, Inc.
WEST Consultants was the hydrology and hydraulics subconsultant for this high-profile highway expansion by the Hawai‘i Department of Transportation (HDOT). As the only highway connecting with the Kona International Airport, the Queen Ka‘ahumanu Highway is critical to life on the big island. Despite the project already being several months behind a critical path schedule, WEST was able to complete a full hydrologic and hydraulic design study under an accelerated schedule, which brought the overall project back on schedule. 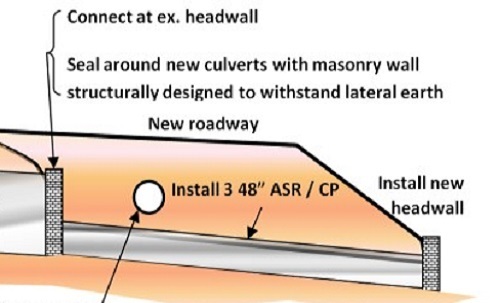 In addition, WEST has since been able to execute multiple unexpected fast-track analyses found to be necessary, but beyond the original scope, including a flooding run-out analysis, unexpected compound culvert design, proposed highway realignments, and a forensic hydrology study. The latter effort, one of the first of its kind in Hawai‘i, utilized historic data, interviews with HDOT personnel, and field evidence to recalibrate the existing peak flow design equations for the area.The work was accepted by HDOT as sufficient evidence to reduce the design flow requirements for the project, which is projected to save more than 50 percent of the budgeted culvert construction costs. Late in the project design process, fears arose as to the possibility of the highway expansion having adverse environmental effects on the adjacent national park due to onsite flow runoff and seepage into the groundwater. WEST was asked to develop Best Management Practice (BMP) strategies that could ensure that the project would filter onsite runoff and control its offset release. Now completed, the measures developed by WEST have been approved by the multiple stakeholders.